I am developing new apps using aspnet 4.6.1, but the application pools on my web server don't show past 4.5.1. How do I update the server so I can get my new apps to run? As far as I know, the application pools version is clr version, not the net framework version. According to this article, the version number of the .NET Framework doesn't necessarily correspond to the version number of the CLR it includes. The following table shows how the two version numbers correlate. I am sorry, I meant to say the clr version. I need to get framework working for 4.6.2 on IIS on a production server. How do I do that? No. 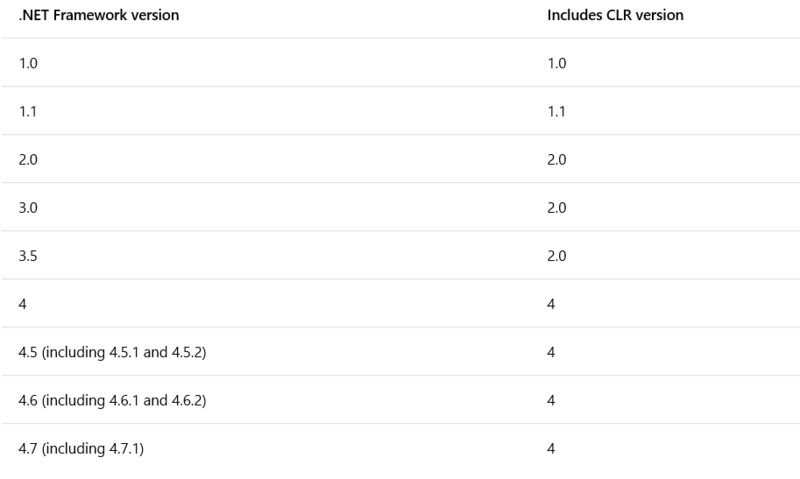 Brando means that the CLR is the SAME for all .NET Framework 4.x versions. So you should not see 4.6.2 or even 4.5.1 but ".NET CLR Version v4.0.30319" in application pool settings. This is not what you see ? You still need to make sure the correct .NET Framework version is installed on the serve0 (ie 4.6.2 which uses still the 4.0 CLR but that will replace all previous 4.x .NET Framework already installed). If you need further help I would suggest to just tell which error message you have (or the best English translation you can) or which bad behavior you see so that we can better understand which issue you are trying to solve. The CLR is the runtime on top of which .NET code runs. It doesn't change which each and every .NET Framework version.